The last time I saw my friend and former newspaper colleague Lorraine Branham was in August 2014 in Boston. We both were attending a reception hosted by the National Association of Black Journalists at Fenway Park. She reintroduced me to her granddaughter Jasmine, 14. Lorraine loved to talk about her granddaughter. But, “I won’t let her call me ‘grandmother,’ ” Lorraine declared. She said it made her feel old. Jasmine shyly returned my hello, and Lorraine directed her to the reception line to find something to eat. And then we sat and talked. I thought of Lorraine on the way home from work on Tuesday. I wondered if I would see her at this year’s NABJ convention in Miami and decided I should thank her for her friendship and mentoring over the years. Later that evening, a co-worker emailed me. “How are you? I’m hearing about Lorraine … I hope you are okay.” It was only then I learned that Branham, 66, dean of the S.I. Newhouse School of Public Communications at Syracuse University for more than a decade, had died of cancer that morning. I first met her when I started a copy editing job with The Evening Sun of Baltimore in 1982 and she was a reporter for the morning paper, The Baltimore Sun. There were 15 or 20 black journalists working for the two papers then, and most of us were still unmarried and childless, with the time to bond as colleagues and friends after work. Several friendships formed then last to this day. Lorraine threw some fun parties at her house — I remember taking my then-boyfriend to her New Year’s Eve bash and one spectacular Halloween party. S.I. 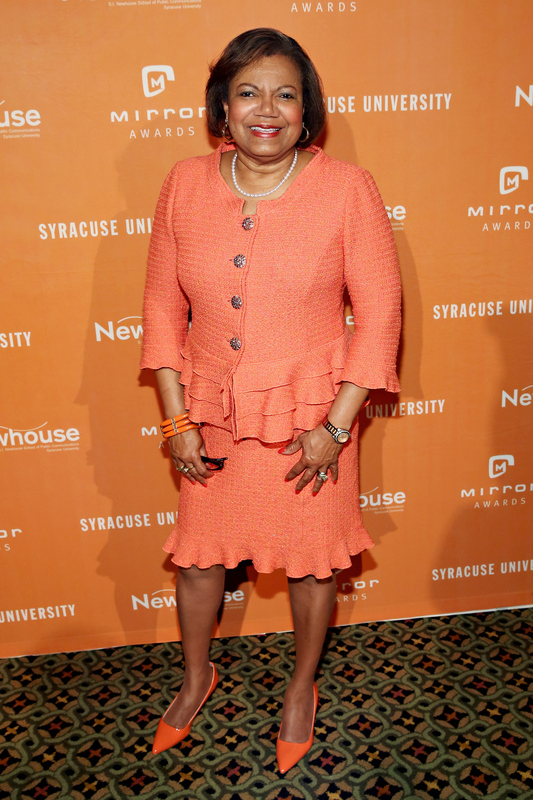 Newhouse School of Public Communications dean Lorraine Branham attends the 2016 Mirror Awards at Cipriani 42nd Street in New York City on June 9, 2016. Lorraine left for The Philadelphia Inquirer in 1983, but it didn’t end our friendship or her support. She delivered a lot of career advice — mostly unsolicited, always on point. Finally, she declared I had to get out of Baltimore. “They’ll never promote you.” She was right. And, eventually, I left. Before I was hired by The Evening Sun, I’d worked at a newspaper in Georgia that had such a racist atmosphere that several of my co-workers had planted a KKK newsletter on my computer terminal. I was encouraged to witness her advance in an industry that makes it difficult for black people to be hired and promotes few black women to management. Branham left a high-level position at the Inquirer to become the first female and first African-American executive editor of the Tallahassee Democrat. If she could be promoted, I could. Lorraine was one of the few black journalists who had longevity in the business and made a successful transition to academia, becoming dean of the journalism school at the University of Texas, Austin before moving on to Syracuse. It’s too late to tell my friend how grateful I am to her. But it’s not too late to salute her legacy: the hundreds of students she inspired at Syracuse and elsewhere; the many, like me, whom she mentored; and the family, friends and colleagues who loved her. Karin Berry is a general editor for The Undefeated. She is an avid reader of crime fiction and a genealogy addict.